I know someone out there is probably saying, “What, another soup that looks like grass clippings? !” I have to beg your indulgence because yes this soup does, in a way, contain grass clippings or, more precisely, garden clippings. You see, I have a small garden plot that’s filled with collard greens that need to be eaten immediately. The plants have started to bolt, growing up tall and thin and sporting flowers that look a little like broccoli. It’s the end of the line for them, so I’m harvesting them as fast as possible to make room for my summer garden. I used about a third of my collards in this recipe, which can easily be made with other greens. I cooked them in a pressure cooker to save time, but use a regular pot if you don’t have a PC (see the instructions below). I assure you it’s much tastier–and healthier–than grass clippings! You can cut the time in half by using a pressure cooker, but stove top works just as well. Add the beans, 2 cups of water or broth, and the remaining seasonings. Simmer for at least 20 minutes to allow flavors to combine. (Use saute or brown setting on electric pressure cooker on lowest temperature available.) While cooking, add additional water or broth if the soup seems too dry. Serve topped with vegan parmesan, if desired. I’m so jealous of your garden greens… no grass comparisons here..
susan – this looks amazing. i adore this bowl AND the photo. 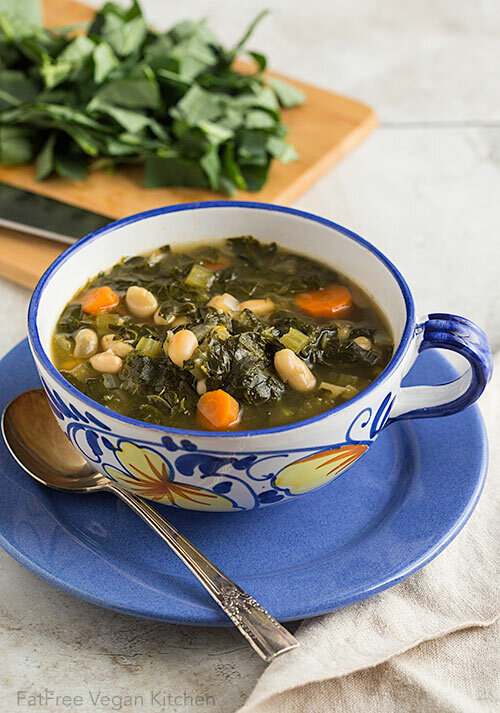 i always find it challenging to photograph soups (stir fry alike) because of the jumble but you really did an amazing job with this one (like i’m surprised…) i have yet to use collard greens in my cooking – can’t wait to try this one out! that is a good-looking soup, susan. Thanks Susan–I have a bunch of collards in my fridge just waiting to be used! I think that I will try this in the crock-pot tomorrow. This dish looks wonderful It is going on my to make list. I love your blog! Mmm, this looks great. Awesome photo too! Your soup looks really yummy. I love collard greens and they’re so nutritious. no complaints here! I love my leafy greens. That is so cool that your garden provided such a bounty of them. And thank you for the birthday wishes- I’m intrigued by all the people who say 28 is a good year- here’s hoping! Susan, this looks beautiful. Did you say you used collard from your garden? A picture of your plants and this will be a perfect entry for Green Blog Project that I’m hosting. Hope you’ll consider. Oh, that looks so good. Collards taste wonderful in the pot liquor–so collard soup is the next step. Beautiful! I’ve got a good-sized and totally wild garden at the moment. With lots of hard work over the coming months/years, I hope to be able to harvest some of my own collard greens in the future:) The soup looks like something I’d really enjoy, btw. more soups that look like grass clippings please! it just looks so slurpable! I made this tonight, & it was GREAT! I think a pan of fresh cornbread would be wonderful with it. This is the first of your recipes I have tried. Thank you! Made it last night as my soup for my week’s lunches at work. Last week’s soup was your egyptian red lentil with green beans and spice mix, which I loved! I was looking for something a little lighter for this week. I used swiss chard and only one can of beans. Very very good. Next time I would use even more thyme and probably basil as well. I am making this tonight! It looks so delicious and even though it is now officially spring, it is cold in Southern Indiana and they are calling for snow! Makes this dish even more inviting. The soup is delicious! We used mustard greens from the Pasadena, CA Saturday morning farmers’ market. Greens always give me such great energy… all the B vitamins. If I could I would have them every day. Thank you for your desire to help others through your love of great vegan cooking and creativity. Keep ’em coming! I am going to try this recipe tonight. I am a collard addict and appreciate new ways to cook my favorite green. I was wondering if I am missing something as there is no way to “rate” this recipe like some of the others that I have come across. This looks like an Americanized version of my Zuppa di Fagioli. (see my blog!) Although my recipe calls for kale I have made it with collards. It calls for italian beans to be authentic but great northerns and pinto work just fine. I think the spices are more definitive anyway. Yours looks a bit spicier, mine is a bit on the rosemary side. I will have to try this recipe soon because my collards are trying to bolt as well. I tried this recipe last night with kale instead of collards. Though I rarely use the pressure cooker, I decided to branch out and try something new. I am so glad I did. The flavors were so rich and the soup was amazing! It was a perfect meal for a brisk Fall night. hi…it's feb 6 2010, and i'm looking for good soup recipes and found yours!!! this looks wonderful to me, but i have to say that most people's way of cooking collard greens (or any of the other big flat greens) doesn't quite get it. hereabouts, they boil the stuff for hours with ham bones, etc. but i prefer to do what my Brazilian friends did: strip the leaves off the stems and roll the leaves up like a cigar. then just chiffonade! i.e., cut off tiny slices that will leave you with long strips of greens that you can stirfry with garlic just until they turn bright green! very edible and tasty that way. what do you think?? 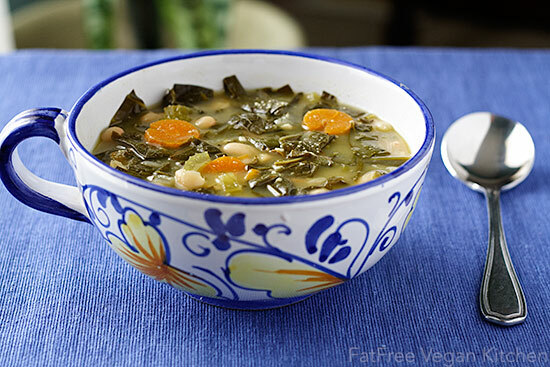 I’d say that sounds a lot like how I cook them here: https://blog.fatfreevegan.com/2006/11/quick-and-delicious-collards.html. I really love how the long strips cook up! I made this tonight and it was very good! Only change I made was to add about 1/4 can of pureed chipotle peppers in adobo sauce (because I didn’t have any chipotle powder and I like the spice/flavor of the stuff!). Very filling and good comfort food. Made this for dinner tonight and it was so good! Thank you for a wonderful recipe and website! I made this soup over the weekend and it was a huge success. Thanks for a great recipe. Thanks for the recipe! It tasted great. I’m looking forward to trying a few more recipes from your site. Take care. Had this for dinner tonight…it was wonderful! I substituted celeriac root for the celery….very good! I’ve been sick with a cold, so wanted something really homey and healthy to help kick the cold. Thanks for the recipe! I think it should freeze pretty well. I’m so glad you enjoyed it! I’m cooking this right now because I just happened to have Collard greens in the fridge and I already tasted a bit of it and it is tasting so good. Can’t wait till it’s done cooking. Thank you for the recipe Susan and for this website it is a lifesaver! I just finished 2 big bowls of this delicious soup! I sprinkled some cashew parm before serving…so good! This is one of our favorites and enjoy it often. just made this tonight!!! used sweet paprika instead of hot. YUUUUMMMYYYY!!! 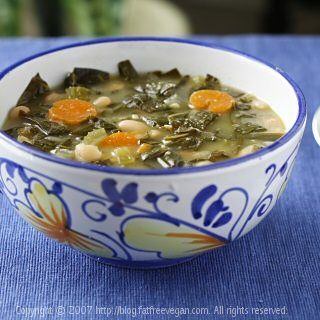 I just made your collard greens and white bean soup and it is amazing!! We live near Asheville NC and our winters can be very cold – this is one recipe that I’ll be making a lot this winter. Thanks for sharing your recipes, have loved everyone of them!!! Made this with a couple pounds of mustard greens and it was super delicious…I added a little bit of red wine vinegar at the end to brighten it. Just what the doctor ordered today! Great and easy vegan soup. I was looking for a soup that fit the ingredients I had on hand and found yours. Thanks. I just made this recipe (currently eating it with cornbread) and it turned out delicious. Thank you! I soaked 1.5 cups white beans and added an extra 4-6 cups of water instead of the canned beans, and then cooked it for 13 minutes with no additional simmer time afterward. I also sautéed the greens’ stems (chopped super finel) with the onions. It was delicious and I’m making it again! I just received an instant pot for Christmas. So I’ve been looking for recipes and came across this one. I had a bag of mixed greens from Trader Joe’s and all the other ingredients on hand. VERY happy with this soup recipe. Thanks so much for posting it!